I love avocado toast. 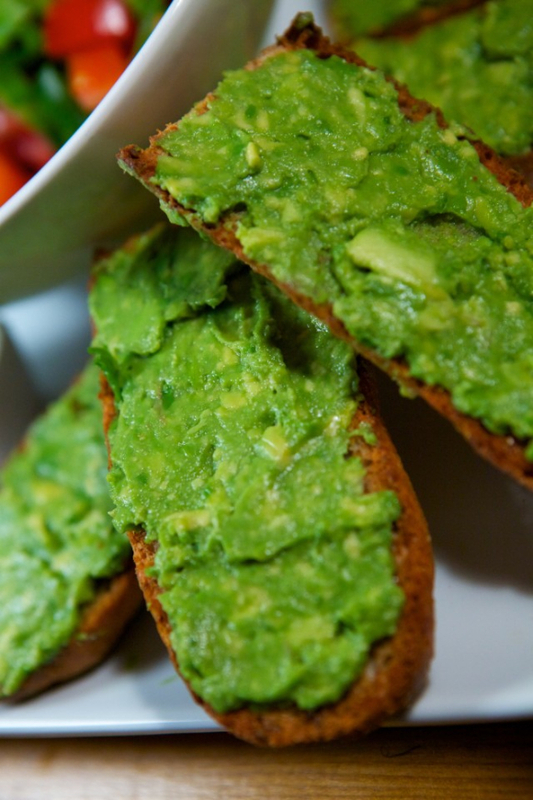 Crunchy from the thick bread, creamy and buttery from the avocado, this luscious gem is so ridiculously easy to make and is easily one of my favourite breakfast, brunch, or snack foods. Over the Labour Day weekend, we decided to take this tasty little treat and turn it up a notch by adding a tomato and green onion salsa and topping it with paprika shrimp and basil. Each bite was so succulent and full of fresh flavour -- it made for an incredibly satisfying meal. 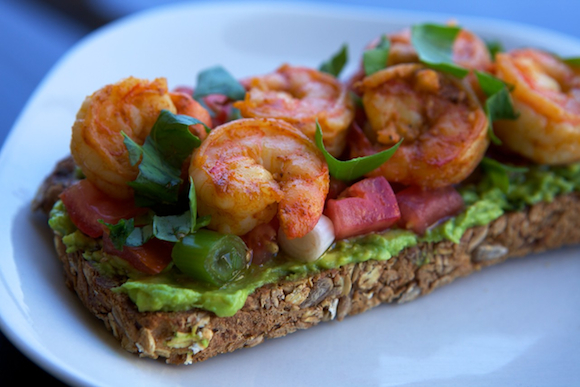 We used a multigrain baguette (love the texture) and had a bit of leftover shrimp, salsa and an extra avocado, so we toasted a few slices of bread and happily devoured it for brunch the next day. 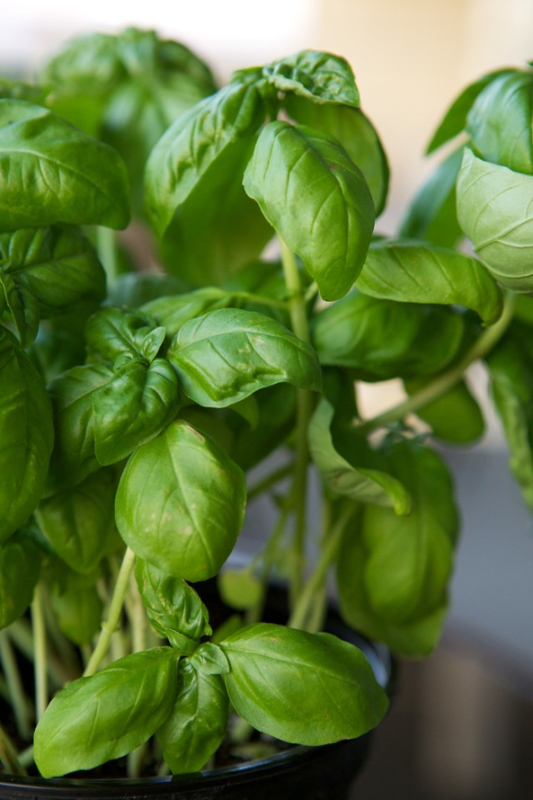 Pablo, our first basil plant. Yes, we named it. 1. 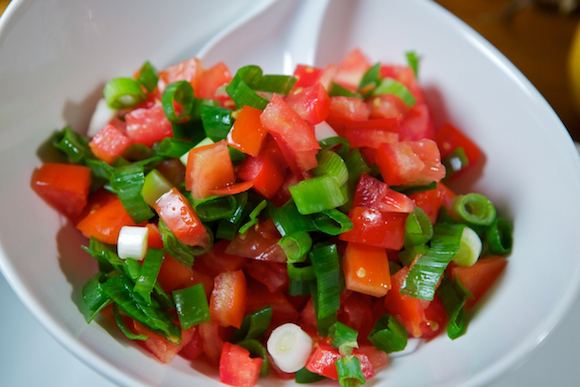 Dice the tomatoes into small chunks and chop the green onions thinly. Mix them in a bowl and set aside. 1. Slice the baguette lengthwise and cut into 5-6 inch slices (3-4 inches for smaller pieces). 2. Place on a baking tray lined with aluminum foil, and lightly brush each slice with olive oil. 3. Toast in the oven for about 15-20 minutes until lightly golden brown on top. 4. Remove from oven and while still hot, rub a clove of garlic (cut side) on each piece. This gives the bread a hint of garlic flavour without being overpowering. 1. If using frozen shrimp, let it thaw out first. Heat a large pan on medium low heat. 2. When the pan is hot, drizzle a good amount of olive oil in and add the minced garlic clove and smoked paprika. 3. Stir it into the oil for about a minute, then turn up the heat to medium high and add the shrimp. 4. Season with salt and pepper and cook for 1 minute, then flip them over and cook for another minute until shrimp is pink. Be sure to not overcook the shrimp! 5. Transfer to a plate and squeeze half a lime or lemon over them. 1. In a bowl, mash the avocados with a fork until smooth and creamy. 2. Squeeze half a lime or lemon in and mix. 3. Spread a nice, thick layer on the bread, and drizzle a bit of olive oil over it. Sprinkle some sea salt and black pepper on top. 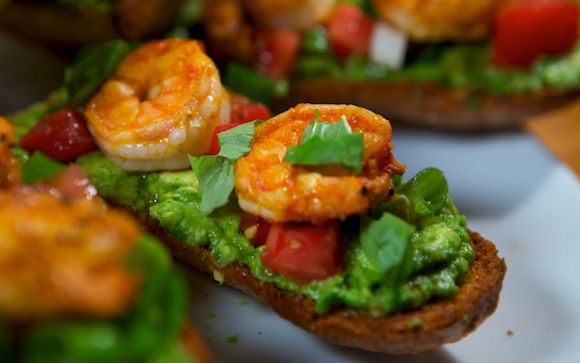 Scoop the tomato and green onion mixture on the avocado baguette, then top with shrimp and basil. This is a beautiful post! Looks delicious and yummy. You know you can share recipes and foodie blog posts too in our Good Eats if you want to! Love everything you do!! Have a fab weekend.